The rise of the internet was, and continues to be, tough for music giants. In the heyday of the industry – when vinyl and CD sales were strong – labels were profitable, but illegal downloading took the bottom out of it. The fall hit everyone in the industry hard, but mobile technology gave publishers and creators a new lease of life. To understand this, we need to ask a simple question: how is mobile changing the world? The app economy isforecast to be worth $6.3 trillion in 2021, with the same report revealing that, in 2016, 1.6 trillion hours were spent in apps – an increase of over 150 billion from the previous year. That’s approximately 2 hours a day spent in apps. The music industry needs to adapt strategy in this new war of attention. 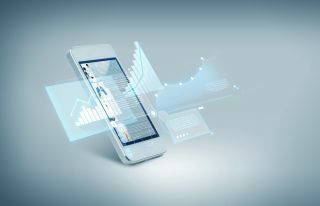 The key to succeeding in this new mobile environment? Data. Music has never been easier to access - but with so much music now readily available for free, how is the industry making any money? Apps have been an integral cog in turning potential customers into fully-paid subscribers. Each of the major streaming services have had success in using the technology to drive revenue and, ultimately, boost their bottom line. A prime example of this is Spotify. Although this has now stopped, the company was initially very successful when it pushed subscriptions through Apple’s App Store. This allowed swathes of people to open a recurring subscription without having to enter any credit card details, making the whole process frictionless. Other streaming providers have also looked towards app-based tactics to increase subscriptions. When Apple Music first launched, it drove people through its native music app to the service. This meant that it was able to attract customers who were already keen music listeners. On top of this, by offering a free 3-month trial period when the app launched, Apple was able to hook in a large,paying user base. This helped the company acquire 6.5m subscribed customers in only three and a half months. Deezer has also implemented some inventive strategies for increasing its user base and improving monetisation. One of the most successful of these was its partnership with Sonos, the app-powered home music system. The company ran a campaign that – when you bought some of its products – you were given a free year’s subscription to Deezer. This meant that people who took advantage of this offer were embedded in the streaming service’s ecosystem, meaning many continued their subscriptions long after the free period. This partnership has also continued with Deezer Elite – a lossless version of the streaming service – only available on Sonos. Streaming has outstripped radio, CD and digital downloads, becoming the prime channel of music consumption, especially for millennials. Data on Spotify released last year reveals that 67.2% of the time millennials spent listening to music on the platform was on mobile. For example, in the first half of 2017, the top 5 Music and Audio Category apps averaged more than 70 million monthly active users on Android phones*. This move has been broadly beneficial for the music industry, cutting down the number of illegal downloads and pushing labels further into profit. Music streaming services – a type of technology dominated by apps – are leading the way. This shift has had a huge impact on the way music is made, distributed and promoted. Such disruption means that the music industry must understand how to implement and take advantage of mobile-first strategies in a crowded marketplace. Only by harnessing mobile technology insights and measuring its results will music industry leaders avoid diving blindly into an increasingly competitive landscape. Mobile has quietly been changing the way music is made right under our noses. Entire albums can be recorded through apps (for example, the Gorillaz’ album ‘The Fall’) that once would have involved a huge studio. Mobile has even impacted how music sounds. Most consumers of digital music listen to compressed formats like MP3s through cheap iPhone headphones and low quality phone speakers. As well as tackling the war of attention, the music industry entered the noise war. Battle tactics include changing how tracks are mastered, with certain frequencies prioritised and more subtle ones left out.Artistry aside, from a commercial standpoint there’s fierce competition to get heard. The successful music companies are the ones who understand that it’s crucial to strategize around consumer mobile behaviour. The rise of mobile-first music streaming services, such as Amazon Music, Apple Music, Google Music and Soundcloud, has made it easier than ever for musicians to upload and, ultimately, share their music with people who might enjoy it. Alongside this, however, are the ‘quality wars’. While Spotify is the most popular streaming service, there are those who would rather not listen to the compressed form of music it serves. Instead, they move to high-quality, lossless services like TIDAL. However, it’s likely Tidal won’t hold a monopoly on high res streaming for long, with Spotify planning on releasing its own service in the same vein. The opportunity to drive revenue for music streaming apps isn’t only reliant on its subscription model or artist exclusives. The data-rich app platforms they rely on provide invaluable insights into its users, priming a successful in-app marketing strategy. For example, by exploring the profile of your user, streaming services can more strategically execute in-app advertising campaigns and create an increasingly personalised user experience which, in turn, increases loyalty and engagement. It’s likely that there are some in the music industry reticent to adopt metrics as fundamental to their strategy, instead staying ‘loyal’ to artistry. However, it’s thanks to mobile that otherwise unknown artists from small towns can get in front of an audience of millions without moving an inch. Thanks to the apps connected to the cloud, it’s now possible to have a truly wireless and mobile music experience. From listening via Alexa while getting ready for work, through your mobile streamed through Bluetooth in your car (or even the Apple Music in-car app) to wireless home audio speakers in the office. You can even pick up a track halfway through its duration. In the past this access would have been impossible – just imagine carrying around your entire CD collection on-the-go. This cloud-driven, app-enabled proximity to a wide range of music means there is more data than ever on our habits, allowing greater connection between creator and consumer. The lower boundaries to entry into music platforms means, inevitably, a discoverability problem emerges, with increasing competition to get heard. Enter the algorithm. The fact we listen to most of our music on our connected phones (rather than the previous trend of non-internet based MP3 players like the iPod) gives greater insight into our habits. The more music streaming services learn about its listeners, the more it can recommend. By personalising the listening experience through recommended artists and playlists, the more artists get pushed to the front. Spotify is perhaps ones of the best examples of a streaming service that really understood the need to address its music graveyard. By understanding its users, it unearthed otherwise unheard tracks and artists through recommended playlists. Discover Weekly uses listener data to pick a selection of artists reflective of the individual’s taste, displaying it in a playlist every seven days. This works for a variety of reasons. Firstly, it’s a relevant use of data, something consumers are roundly positive about. Secondly, it allows Spotify and artists themselves to promote certain tracks – of course based on user habits and behaviour – but at the same time delivering the indescribably intimate feeling of stumbling across an artist you love. Intelligent action on data is changing the prospects of artists as well as consumers’ own experiences with music. Algorithms and data are now the heartbeat behind modern music discovery. Release Radar functions differently, in that it shows the listener a selection of new releases from artists they already follow. Again, this is driven by data, putting a user in front of a song they otherwise might have missed. This feature can also be used to support concert dates, driving digital listeners to physical places; Spotify recently partnered with Eventbrite and AXS to help users find concert tickets at nearby venues. Ultimately, the app-first world of music streaming has turned the industry on its head. By giving people an easy and powerful way to access music, the entire sector has benefitted. Still, while it is easier than ever to get music out there, it has never been harder to get heard. This means that artists and marketers need to evolve. It’s no longer about big billboards and TV ads, but in-app advertisements and progressive partnerships. More people than ever have their ears to the ground, just make sure yours is the sound that they hear.